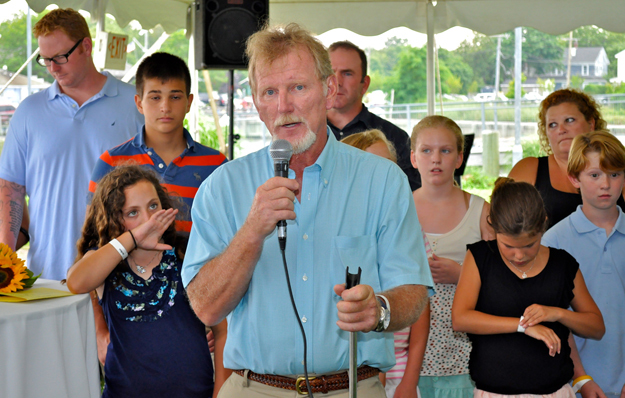 Funeral services set for George Costello Sr.
TIM KELLY FILE PHOTO | George Costello Sr. speaking during the San Simeon fundraiser in Greenport in July 2011. Funeral services have been scheduled for George Costello Sr. of Greenport, a partner in the Costello Marine dock and bulkhead construction business and the driving force behind the volunteer restoration of Greenport’s historic roller rink, who died on Dec. 28 at age 63. Visiting will take place at the Horton-Mathie Funeral Home in Greenport on Tuesday evening, Jan. 1, from 7 to 9 p.m. and on Wednesday from 2 to 4 and 7 to 9. Father Thomas Murray, pastor of St. Agnes R.C. Church in Greenport will lead a service at the funeral home on Thursday, Jan. 3, at 10 a.m. Burial will follow at Arshamomaque Cemetery, also in Greenport. Mr. Costello was at work on a job in Southampton when he collapsed Friday, said longtime friend Fred Schoenstein of North Fork Welding. He was taken to Southampton Hospital, where he was pronounced dead. A Vietnam War veteran, Mr. Costello was known for his involvement in numerous community projects, particularly the restoration of the historic roller rink at the Burton Potter Legion Hall on Third Street. He and his fellow volunteers were named The Suffolk Times’ “civic people of the year” for 2011. “His dedication to Greenport was unbelievable,” said Craig Richter, Burton Potter Post commander and a fellow rink project volunteer. Mr. Richter said the legion should redouble its efforts to complete the project in Mr. Costello’s memory. In July 2011 the San Simeon by the Sound nursing facility honored the Costello family, particularly George and John, for taking such an active role in the community. The Costello family asked for donations to the Burton Potter rebuilding fund.